A simple, vegetarian recipe that celebrates the moment between spring and summer. You can leave out the cheese if you want the dish to be vegan! Preheat the oven to 350 degrees and lightly toast the walnuts for 8-10 minutes. Allow to cool and chop the walnuts lightly. 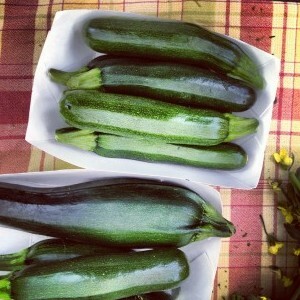 Heat the olive oil in a large heavy pan and add the zucchini. Saute over medium-high heat, tossing the quash in the pan until it's tender and lightly browned. Turn off the heat and season it with salt, pepper, and the herbs. Cook the pasta in abundant, salted water. Before you drain it, reserve some of the cooking water. Toss the noodles with the seasoned squash, a splash of the cooking water, and the walnuts. Plate and garnish with grated cheese, if desired. Not Included in the Large Real Food Boxes: Olive Oil, Salt, Pepper.